Personal Public Mail lets you use any @6url.com email address anywhere—preferably when somebody you do not trust requests one. Anybody can then come to the Personal Public Mail site and retrieve all mail received at "your" address. This, and that message cannot be manually removed, means you should only use Personal Public Mail if you do not expect to receive any mail at all. Personal Public Mail is no longer available. You can always try a different disposable email address service, of course. 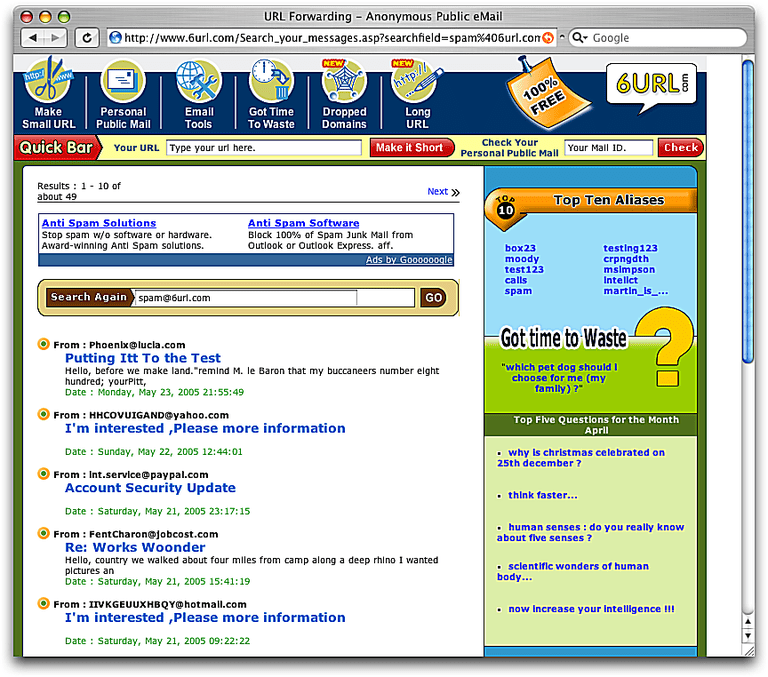 Personal Public Mail makes any @6url.com email address available to anyone. Mail sent to a Personal Public Mail address can be read by entering just the user name. Can be used whenever an email address is required for something but email. Email addresses created at Personal Public Mail have no connection to you. Received messages are deleted periodically. Personal Public Mail displays mail as plain text only by default (you can switch to full HTML). If you have ever fancied reading somebody else's mail, Personal Public Mail is a place to go. Any email address that ends in @6url.com can be used by anybody anywhere, and you can review the mail received at any of these addresses. Of course, what you will find is predominantly spam, because receiving spam, not email, is Personal Public Mail's true mission. Whenever somebody—a web site, for example—asks you for a valid email address and promises to do nothing with it, this is the perfect occasion to a Personal Public Mail address. If they keep their promise, nothing happens. If they do not keep their promise (and sell the email address to spammers, for example), all that can happen is that a poor soul looks up the @6url.com address you made up on the Personal Public Mail site and sees the junk mail. Naturally, you should not use Personal Public Mail if you do expect any personal response—not to mention passwords and order confirmations. It might be okay to use Personal Public Mail to subscribe to newsletters, but even for them dragging the emails to the public is problematic. So, Personal Public Mail is mostly a service to amuse—both when you look up fancy email address and when you create them.